This article was written by Kia Marie Hunt from The University of Birmingham, published on 13th October 2015 and has been read 1663 times. I can’t believe I’m saying this but: I’ve now been living in Uruguay for just over two months! It’s such a strange feeling because the time has flown by really fast, but I’ve also done so many things that it feels like I’ve been here forever. 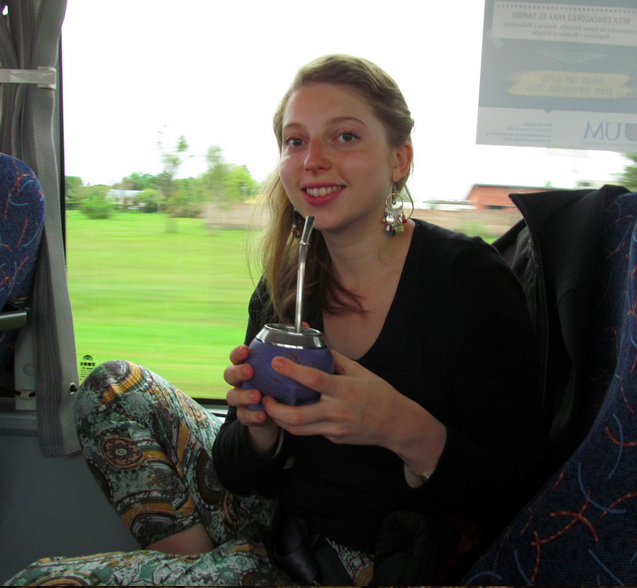 Yes, I finally tried this mysterious green beverage that everybody in Uruguay is so obsessed with! At first I wasn’t sure what the fuss was about, it kind of tastes like green tea but a little more bitter. Yet when I was offered it again, I found myself accepting more and more enthusiastically each time; it was a cold and windy day and there was something oddly comforting about holding the mate gourd in both hands and sipping such a hot drink through the special metal straw (bombilla), I suppose just as us Brits would find comfort in a good cuppa. Also, I never realised this before, but yerba mate is crazily caffeinated - it contains as much caffeine as coffee! Now it’s definitely easier to understand why people are so addicted to it. I’m even coming round to enjoying dulce de leche, a substance so sickly sweet that I at first found it repulsive. But everyone eats it here, and, little by little, I find myself liking it; I wouldn’t be surprised if come this time next month I’m writing about how I’ve gotten myself addicted to that too! Now I promise, not all of the things I’ve grown to love about Uruguay are super unhealthy! I’ve also developed a rather healthy habit of buying my weekly groceries at the Sunday street market in Montevideo; which means lots and lots of fresh fruit and vegetables. So I don’t feel too guilty about my addiction to biscuits when the majority of the time the rest of my diet consists of fresh blueberries, apples, bananas, avocados, sweet potatoes, etc. Not only is the market a great place to buy cheap and delicious food, I also love it because it feels so special. Shopping at the supermarket feels like a chore, whereas waiting to go to the street market every Sunday is more like a fun morning out, and it’s definitely worth the pain of heaving a heavy bag home afterwards. Going there is a real chance to feel immersed in the Uruguayan culture; it’s bustling with people buying, selling, (and yelling!) and there is often a band playing there too. The street is so huge that you can spend all morning exploring, and it doesn’t just sell fruit and vegetables, you can find anything and everything there… You can buy clothes, souvenirs, plants, and mate cups, there are stalls that sell pets (including the cutest little kittens and bunny rabbits I have ever seen) and stalls that sell hundreds of books. 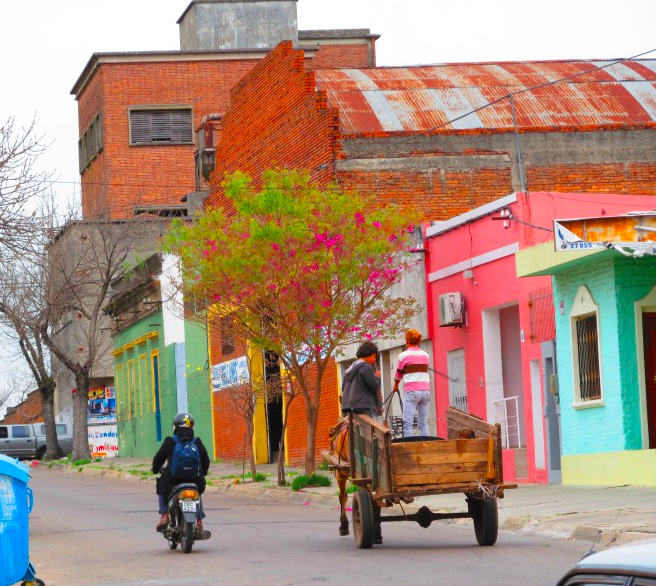 Plus, many Uruguayan artists go to the markets to sell their beautiful craft-work. And, if you’re exhausted from walking up and down and absorbing all that culture, you can refresh yourself at the stalls that sell freshly squeezed orange juice, or yummy homemade kebabs. Cumbia is a genre of music that is really popular in Uruguay, so popular that I hear it literally wherever I go; in the shops, in clubs, on the streets as people blast it out of their cars. You just can’t get away from it! I have to admit it, when I first got here, I absolutely hated it. It would always get stuck in my head and every song sounded exactly the same and when they played it in clubs the beat was far too slow to dance to and it just annoyed the hell out of me. But, (surprise surprise) I slowly became accustomed to it. I think its something to do with getting used to the slow Uruguayan life and how time is just casually ticking over, because now that I have more patience, the weird beat of Cumbia doesn’t frustrate me anymore. And now, I absolutely love it! I’m sure I know a lot of Uruguayans that will read this and cringe but I can’t help it, I love Cumbia! Me and my housemate are still in disbelief that we somehow still like it, its crazy that we’ve gone from such having such hatred towards it to now actively choosing to play it when we are getting ready to go out! It makes me so damn happy and I love dancing around to it, so to everyone back at home; I apologise in advance for how much Cumbia I will be playing when I return! (I don’t expect you to like it, but just know that you can’t stop me). Okay, I don’t actually know anything about architecture, so when I say that I’ve grown to love it here, what I mean is that I find myself being much more interested in buildings and their designs here than I ever was back in the UK. Correct me if I’m wrong, but in many places, England included, there are laws in place which mean that the design of a new construction must be similar to the rest of the buildings in that area. However, it seems that rule either does not exist here, or no one cares about it. Although I’m no expert, it seems that there are two more things that influence the architecture here, the first is that almost 88% of the Uruguayan population is of European descent, which means you can see examples of architecture from absolutely all over the place. The second is that there doesn’t seem to be a clear divide between poor and rich areas, instead, a beautiful rich house can be found right next to a poor, impoverished one. This means its difficult for me to walk down any street without saying “look at that building!” or “look how different that house is to that house!” which may be annoying for some of the people that I’m with, but it is certainly interesting for me!